I drew it on paper, standing on the deck at Legend Brewery a few weeks ago in the morning before they opened, and left when the customers started to come in for lunch. It took me a few weeks to get my charcoal sketch, as seen on a post below, then more time to draw it on the canvas with charcoal. I didn’t use a photo, but measured the perspective by holding my charcoal out at an arm’s length and using the Federal Reserve building as a unit of measure. I thought I had the perspective close enough to real, then I ran into a stopping point when I started on the underpainting one morning. The light is better in the afternoon on the city, but Legend gets crowded some afternoons, and the weather is still iffy a lot of days, which stopped me and was a problem I needed to work out before painting. This painting is complicated, and after years of drawing from life outside in nature, I don’t enjoy painting from a photo. When you get used to seeing the subject life size, then have to look at a photo, it’s like the photo is so small and the perspective is smushed and the colors are flat. It was just more practical to use photos at this step. I had my camera set on automatic for the shots printed out here, and taped them together, so I could get the afternoon light in my underpainting. I took these shots from the floodwall, which is a little lower and closer to the river than Legend. The skyline looks like 36 inches to my naked eye and looks like 18 inches to my camera. I did the underpainting at home. I’d rather have been at Legend. I had to get a different state of mind to paint using the photos. I hear other artists get stuck with a painting too. I went over to Lewis Ginter Botanical Garden and drew some Lotus flowers, meanwhile. And I need to draw more Lotuses before I can get a plan worked out for the Lotus painting. The Lotuses are a good distraction from the difficult city painting. Our teachers at York Academy of Art told us to do a detailed underpainting. It wasn’t easy, but I got it, finally. 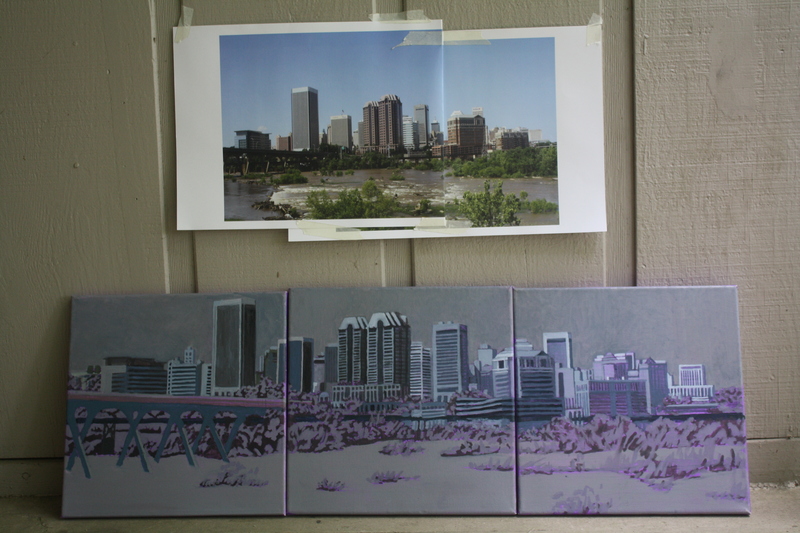 At this rate, I’ll probably have the painting finished by Aug. for the show I entered at Artworks. Now I have to go to Legend in the afternoon to mix my colors. Building up layers of color on top of my dark underpainting with the lightest and brightest colors the most opaque, I hope to get the illusion of depth in the painting, and make my city POP!! Previous Speaking Your Language! Next Shall I Tell You About My Life?